Wow, I have received my very first blog award. I feel incredibly honoured. Thank you Elizabeth from The Foodie Mommie. She has a very cool blog where you will find amazing recipes, tips, videos, giveaways, and live web classes to help you plan and prepare delicious, nutritious meals for you and your family. Thank you ever so much. Not as easy as it looks! ...Ok, authentically sharing real experiences creatively. There. Did it! A well-deserved CONGRATS to you! Thanks so much girl! I'm tickled pink and speechless. Thanks so much for dropping by today! Congrats on your award! You really do deserve it! Thank you so much for thinking of me to pass it on too! I will make a post soon! Oh Scott, do I have to always dumb it down for you? Congratulations and great choices for the other blogs! 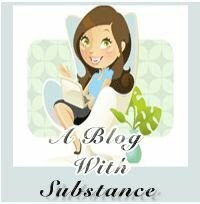 Your blog header is fantastic! Whose work is that?!? Following you from Blogfrog. Thanks for the follows.